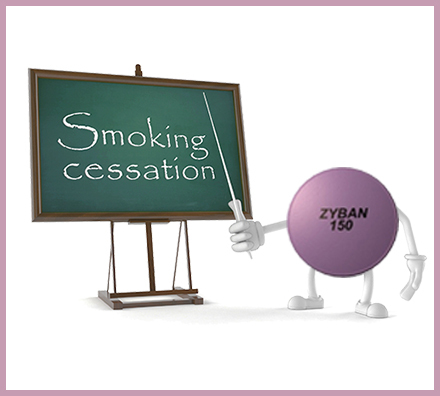 A popular prescription medication or stop smoking aid to help you quit smoking is Zyban. Zyban is a stop smoking pill that was previously sold as the anti-depressant Wellbutrin (buproprion hydrochloride). It is best known for taking away your urge to have a cigarette. Unlike other Nicotine Replacement Therapies (NRT’s), Zyban does not include nicotine. The primary idea behind using the pill is that you will continue smoking until you just don’t have the urge to do so while taking Zyban. How Does Zyban Make Quitting Smoking Easier? When you take Zyban in order to quit smoking, it will reduce the symptoms your body experiences from nicotine withdrawal when you quit smoking. It has the biggest effect on reducing the irritability, anger, problems concentrating, and anxiety that are normally experienced when kicking the habit. Many smokers also say that Zyban just helps curb their overall desire for a cigarette to the point that they no longer want to smoke. Zyban does have side-effects. If you are taking the medication you should seek advice from your doctor. On the Zyban website, the side effects stated are “dry mouth and difficulty sleeping…There is a risk of seizure associated with Zyban , which is increased in certain patients.” Due to these potential increased risks in certain patients, Zyban remains a prescription medication that has the risks mitigated through your physician determining if you are at risk through using the drug. Many times the risks of continuing to smoke will outweigh the risks associated with the drug. Some of the at-risk patients that doctors may not prescribe Zyban to are: those with a current or prior diagnosis of bulimia or anorexia, those suffering from alcoholism, thos taking MAO inhibitors, those with a history or prior occurrence of a seizure, addiction to cocaine or other hard drugs, and those with a demonstrated allergy to buproprion. When you are taking Zyban as a stop smoking aid, the max daily dose your doctor will subscribe you is 300 mg/day with 150 md/pill as the max single dosage recommended by the manufacturer.